Researchers with Washington State University (WSU) may have found a way help save honeybees by introducing micro-particles into the insects’ digestive systems, and from there the particles would absorb the damaging toxins often in pesticides. WSU bioengineering project manager Waled Suliman has stated that the material his team has developed only attracts specific compounds within pesticides based on the toxins’ temperature and acidity. Understandably, honey lovers may be wondering if it’s possible for these “sponges” to be transferred into the products they’re buying. However, this isn’t likely to happen due to the honeybees being treated outside honey season only. According to Brandon Hopkins, a WSU research professor, “That honey production time is usually when bees aren’t exposed to these agro-chemicals. They’re usually exposed during pollination seasons.” These helpful particles help reduce “sub-lethal” toxin levels that can build up within honeybees, per Hopkins. Reducing the number of pesticides within a bee’s system could lead to its improved health overall, which in turn will lead to healthier hives and more honey. 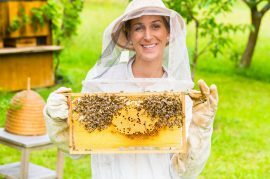 With honeybee health under a microscope in recent decades, given that some beekeepers report losing half their hives in a given year due to varroa mites, pesticides, and diseases, discoveries like this are crucial steps forward for the pollinators responsible for 75 percent of the food we eat. Before this product can become available to the public, Suliman’s team must improve its design to make it more feasible. Currently, they use bee pollen for creating the toxin-absorbing micro-particles. However, it’s too costly to be viable commercially, so the team must look at alternatives. Efficiency must also increase, so that the toxic residues are absorbed prior to the honeybee’s cells doing do. The micro-particles would also work better if they stayed within a bee’s gut for a longer period of time. “We compete with the time, so our material should work faster than the digestive system,” says Suliman, who hopes the product will be commercially available in the next year or two.